AFGHANISTAN - Most often, we in the West are exposed to and challenged by an increased number of news stories of the heinous, misogynistic treatment of women and young girls all in other parts of the world. Thankfully, there are a cadre of people and organizations dedicated to bringing greater public awareness to these gross injustices and when possible physically intervening in the lives of these women to improve their conditions or alleviate their suffering. In an earlier post Nujood Ali a young Yemeni girl speaks of her ordeal as a child bride and the abuse she suffered. Now, we are privy to the suffering of another young teenager; an Afghan girl who was horribly mutilated by her husband under Taliban rule. 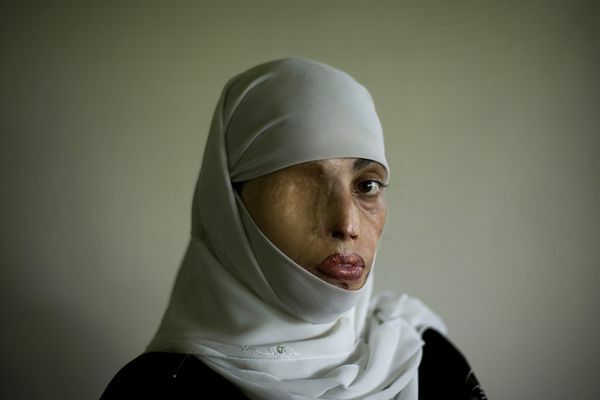 Last year Bibi Aisha was horribly disfigured by her husband who cut off her nose. Last week, there was report of another Afghan girl who was beaten for refusing to submit to prostitution. Unfortunately, these stories are becoming more common, but Aisha, 19, has become the face of this heinous behavior. In the summer of 2010, she shocked the world when she appeared on the cover of Time Magazine vividly displaying her severed nose. When Aisha was 12, her father promised her in marriage to a Taliban fighter to pay a debt. She was handed over to his family who abused her and forced her to sleep in the stable with the animals. When she tried to run away, she was caught by her husband who brutally hacked off her nose and both ears, before leaving her for dead in the mountains. Subsequent to her return to consciousness, she crawled down the mountain to her grandfather's house. Later, her father arranged to have her treated at an American medical facility where she remained for the next 10 weeks. Once she was stable, she was transported to a secret shelter in Kabul and in August she was flown to the U.S. by the Grossman Burn Foundation to stay with a host family. Last week she returned to the public stage wearing a new prosthetic nose - one that gives her some idea of how she will look after having reconstructive surgery. This month after extensive counseling for her traumatic experience, she finally received a prosthetic nose fitted at the non-profit humanitarian Grossman Burn Center at West Hills Hospital in California as part of her eight-month rehabilitation. Dr Peter H. Grossman said they hoped to reconstruct Aisha's nose and ears using bone, tissue and cartilage from other parts of her body. The UN estimates that nearly 90 per cent of Afghanistan's women suffer from some sort of domestic abuse.